Soupa Avgolemono is a classic Greek lemon soup with simple origins, but with an inventive twist of whipped eggs and lemon juice to thicken the soup it is transformed into a smoothly textured puree with a pale creamy tempera like color and zesty undertones that elevates this soup to the sublime. Traditionally made with rice, but equally suited to using white beans, and in this recipe the addition of celeriac (celery root), this classic soup easily accommodates seasonal complimentary additions as well such as spinach, chard, or watercress. Pick through the dried beans and remove any small stones that may have found their way into the beans when sun drying. Place the beans, onions, garlic, bay leaves, and plenty of water in a suitable stock pot with lid. Place over medium high heat until the water boils, then lower the heat and simmer the beans, partially covered, for 1 to 2 hours depending on the age of the beans. Stir now and again as the beans cook. The beans should be very soft for the soup, so use your own judgment by tasting. Drain the beans in a colander, remove the bay leaves, and set aside. Heat the olive oil in a medium stock pot and add the onions and garlic and saute until soft and translucent. Add the stock and stir to combine. Add the cooked beans, shredded celeriac, lemon thyme, salt, and ground white pepper. Bring the pot to a simmer and partially cover with lid and cook for 30 minutes. Turn off the heat. Blend the contents in the pot with a hand held blender, or transfer to a blender, and blend for several minutes until the beans and celeriac are pureed and the soup is smooth. Beat the egg yolks and egg whites separately, beating the whites until they form soft peaks. Fold the egg yolks into the egg whites until well combined. While briskly stirring begin to add the lemon juice to the egg mixture in a slow stream, stirring it into until well incorperated. Scoop out 1 ½ cups warm soup puree from the stock pot and slowly add it to the egg lemon juice mixture. This will temper the eggs so they don’t curdle when added to the soup. Add the egg lemon mixture to the pureed soup in the stock pot and stir in until well combined. Turn the heat on to medium low and stir continuously until the soup thickens, being very careful that the soup does not begin to boil, which will cook the eggs and curdle the soup! This will take about 8-10 minutes. Once the soup has thickened remove it from the heat immediately. Assemble the crostini, topping each piece with grated Feta. Top with lemon zest. 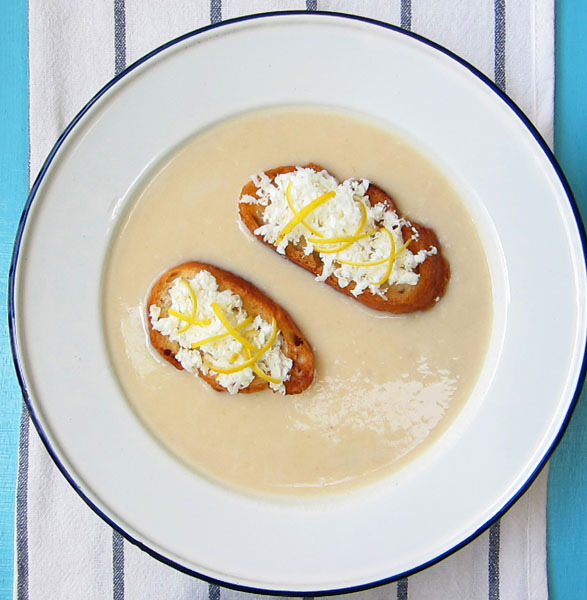 Ladle the warm soup into serving bowls and float two crostini on the surface of each serving of soup. The soup may be refrigerated, once cooled to room temperature. To re-heat bring the soup to room temperature, place on medium low heat and stir until the soup is hot. Again do not allow the soup to boil when re-heating!